Scroll down to see our selection of eating utensils for sale. 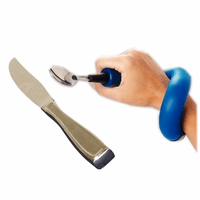 Eating utensils are used by disabled persons with limited hand strength. We carry a variety of eating utensils for sale including flexible eating utensils, weighted eating utensils, one way drinking straws and foam eating utensil tubing. What are eating utensils? Eating utensils are any specialized fork, spoon or knife that is designed to aid the disabled during meal time. Eating utensils with flexible handles can bend into a variety of positions, helping to evaluate self-feeding needs. Weighted eating utensils are designed for those individuals afflicted with, Parkinson’s disease, Ataxia, or other illness or injuries that cause tremors of the hands. The heavy weight of these utensils steadies the persons’ hand to allow them to eat.